How do I invite employees to join Sling? you choose to delay their invitations until a later time. If you elected to skip this step initially or need to resend an invitation, these are the steps to send one. Go to Dashboard > Employees and find the name of the person you need to send the invitation to. 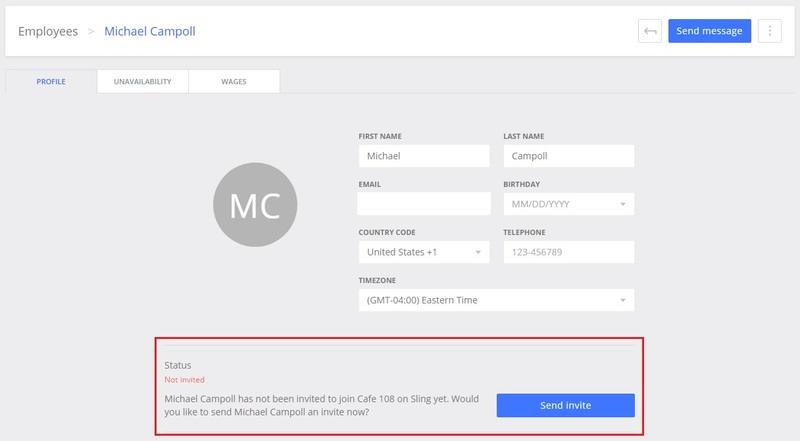 Click the options button (3 dots) and choose Invite employee (if the invitation has never been sent) or Re-invite employee. You can also go directly to an employee's profile to see the option. If you elected not to invite your employees when setting up your account, and need to send invitations to the whole list, go to the Employees tab and click the options button (3 dots), then Invite all. Next, your employees receive an email from sling@sling.is which includes a link to create their own individual access to your company account. Once they have created a password, they will receive a verification email to complete the setup process. It's as simple as clicking the link provided within the verification email. The last step is to go to https://login.getsling.com or download the app and log in! If your employees have any trouble with joining or verifying, please have them contact us via the Intercom icon at the bottom right of the screen, and we will be happy to assist them!